Larger and more resilient samples can be homogenized through the use of grinding balls. 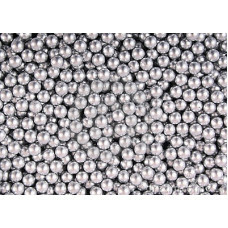 In contrast to grinding beads, which are a pool of beads within a given size range, grinding balls are spherical and precision ground to a specific diameter. They are made of stainless steel, tungsten carbide, or zirconium oxide. 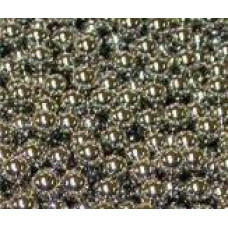 Because of their larger size, grinding balls are more suitable for grinding, whereas beads have insufficient mass to accomplish this. Stainless steel is a hard, highly dense grinding media that can withstand pressure; some types are magnetic, a property that facilitates their removal from vial using magnets. Tungsten carbide is more dense and hard than stainless steel and can be used in circumstances where stainless steel is insufficient. The drawback is that tungsten carbide balls are very expensive. Both stainless steel and tungsten carbide, however, may react with phenol and other acids, thus potentially interfering with sample processes. 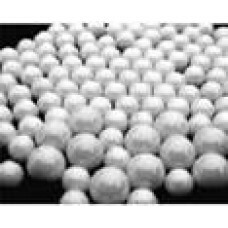 In such cases, zirconium oxide grinding balls, which are chemically stable, can be used. Zirconium oxide balls have a lower density and hardness than stainless steel and tungsten carbide, but in many instances will work well. All grinding balls will generate heat during sample processing. Stainless steel grinding balls are available in 2.8 mm, 3 mm, 5 mm, 5/32’’, 5/16’’, 3/8’’, and 7/16’’ diameters while tungsten carbide grinding balls are 3/8’’ diameter and zirconium grinding balls are 5/32’’ diameter. 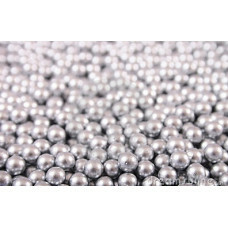 Prior to packaging, grinding balls are treated to remove residual oils and other contaminants. OPS Diagnostics' 3 mm stainless steel grinding balls are useful for homogenizing plant and anim..
OPS Diagnostics' 5mm Stainless steel grinding balls can be used with 4 ml and 15 ml vials to ho..
6 mm zirconium oxide, ceria stabilized satellites are used with individual microfuge tubes, 4 ml pol..
3/8" Stainless steel grinding balls are used with 4 ml and 15 ml vials to homogenize seeds and ..
Tungsten carbide grinding balls are twice the density of stainless steel. Thus, for samples wh..
5/16" Stainless steel grinding balls are used with 4 ml polycarbonate vials to bead beat samples.&nb..
7/16" Stainless steel grinding balls are used with 15 ml polycarbonate vials to bead beat large samp..
Can be used in 96 well plate or 2 ml microfuge tubes. Grinding balls are made of 440C stainless..
5/32" Stainless steel grinding balls are used with 96 deep well plates and individual microfuge tube..
5/32" zirconium oxide satellites are used with deep well plates and individual microfuge tubes to be..